Win a $50 Gift Certificate to Chili’s! Congratulations to Elizabeth Grady on winning our eighteenth High Five Giveaway and thank you to all who entered. 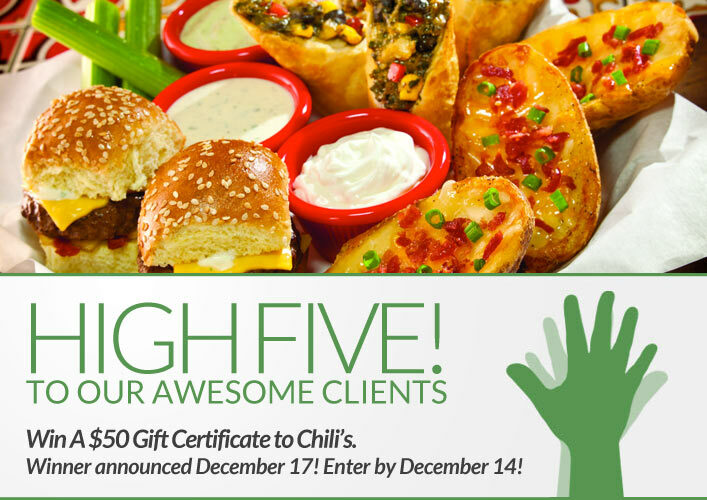 Our next High Five Giveaway is for a $50 gift certificate to Chili’s! Chili’s serves American fare with a tex-mex flair. Thirsty? Chili’s features bottomless beverages, with free refills on coffee, brewed and flavored teas, lemonade and fountain drinks. You may prefer frosted mugs of beer and five varieties of hand-shaken margaritas. Chili’s is located at 2 East Ontario Street. For more information, call them at (312) 943-1510 or visit www.chilis.com. Where is XEX’s completely awesome and fun holiday party happening on Thursday, December 6?!? Now, just add a comment to this post with the right answer to be eligible to win! The winner will be announced on Monday, December 17. Entries must be received by midnight on Saturday, December 14. Good luck! Hard Rock Cafe! Merry Christmas! Hard Rock Cafe, 63 W Ontario. Party at the Hard Rock! Hard Rock Cafe at 63 West Ontario Street, Chicago!